SpaceX’s first Falcon Heavy rocket fired up 27 main engines Wednesday on launch pad 39A at NASA’s Kennedy Space Center in Florida, sending a crackling rumble across the swampy spaceport and moving the heavy-lifter a step closer to its oft-delayed maiden flight as soon as next week. Ramping up to approximately 5 million pounds of ground-shaking thrust, the Falcon Heavy’s 27 Merlin 1D main engines ignited at 12:30 p.m. EST (1730 GMT), running more than 10 seconds as a billowing cloud of exhaust and steam erupted from the flame trench at pad 39A. “First static fire test of Falcon Heavy complete — one step closer to first test flight!” SpaceX tweeted shortly after the hold-down firing. The 229-foot-tall (70-meter) Falcon Heavy is expected to be lowered from pad 39A and rolled back into SpaceX’s hangar for final checks. 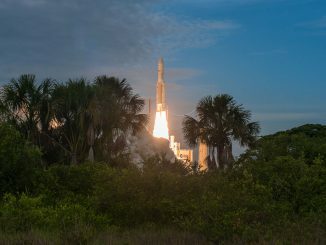 It will return to the seaside launch complex, the former departure point for NASA’s Saturn 5 moon rocket and space shuttle missions, ahead of the target launch date. The test flight’s launch date has not been announced, and SpaceX already has a launch of a Falcon 9 rocket scheduled for Jan. 30 from Cape Canaveral’s Complex 40 launch pad, a few miles to the south of pad 39A. It was not clear Wednesday how much time SpaceX needs between a Falcon 9 and Falcon Heavy launch from different pads, but at least a day or two of separation will likely be required because the missions share personnel and infrastructure, including the U.S. Air Force’s Eastern Range, a network of communications, tracking and safety assets. Wednesday’s static fire test was the culmination of a month-long series of fit checks, fueling tests and other preparatory work at pad 39A since the Falcon Heavy was first raised vertical at the facility Dec. 28. SpaceX’s launch team fueled the Falcon Heavy several times, and ended the rehearsals before the engines would ignite in a normal countdown. Technicians at pad 39A finished upgrading the launch complex for the Falcon Heavy after the most recent Falcon 9 launch there Oct. 30. One more Falcon 9 launch was supposed to blast off from pad 39A in mid-November, but the mission with a classified U.S. government payload named Zuma was grounded nearly two months until it finally launched from pad 40 earlier this month. 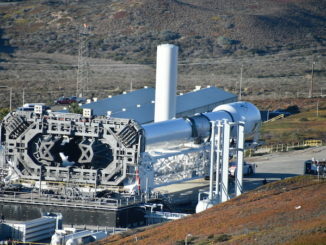 The Zuma payload was reportedly lost soon after the launch when it failed to separate form the Falcon 9’s upper stage. While government officials have not commented publicly on the mission, SpaceX officials said the Falcon 9 performed as intended, leaving outside observers to focus on a possible malfunction in the satellite’s attach fitting, which was provided by Northrop Grumman, Zuma’s prime contractor. Elon Musk unveiled the Falcon Heavy rocket program in 2011, when he said the launcher could take off for the first time in 2013. The Falcon Heavy is made up of three Falcon 9 first stage boosters bolted together — two side boosters with nose cones and a central core with structural stiffeners to take the extra load the heavy-lifter will produce during launch. But the rocket’s development took years longer than Musk predicted, and SpaceX slowed work on the Falcon Heavy to focus on recovering from two Falcon 9 rocket failures in 2015 and 2016. For the inaugural Falcon Heavy test launch, the rocket will be powered by a newly-manufactured core stage and two side-mounted boosters recovered and refurbished after past Falcon 9 missions. The side boosters will jettison from the Falcon Heavy’s core around two-and-a-half minutes after liftoff, then return to land at Cape Canaveral Air Force Station, where SpaceX has upgraded its rocket landing zone for two simultaneous touchdowns. Meanwhile, the center booster will continue firing a bit longer before switching off its nine Merlin engines and dropping back through the atmosphere for a landing on SpaceX’s rocket recovery barge in the Atlantic Ocean. An upper stage similar to the Falcon 9’s will take over to drive into orbit. The hotfire test Wednesday was the first time all 27 of the Falcon Heavy’s engines have ignited together. The test-firing produced more thrust than any rocket has generated at the Florida spaceport since the retirement of the space shuttle in 2011. SpaceX does not have a test stand at its Central Texas development site to support such a high-thrust firing. The Falcon Heavy will weigh more than 3.1 million pounds (1.4 million kilograms) fully loaded with kerosene and liquid oxygen propellants. On its first flight, the Falcon Heavy will generate about 4.7 million pounds of thrust at launch. 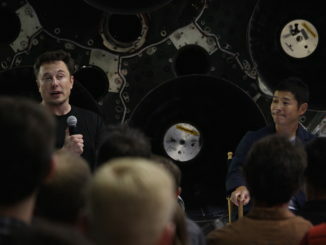 Musk said the first Falcon Heavy’s engines will be throttled to 92 percent of full power. The Falcon Heavy will also be able to carry more payload into orbit than any other rocket in the world — and the most by any launcher since the Saturn 5 — a more important measure of the rocket’s lifting capacity. 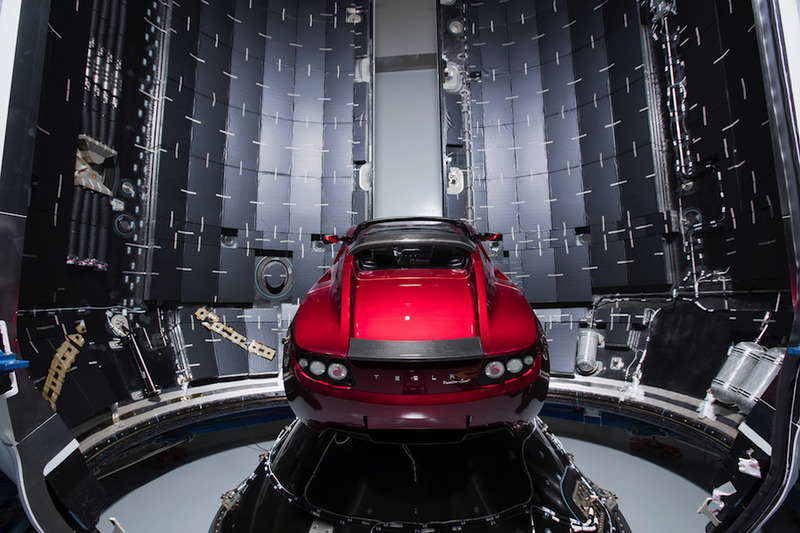 For the Falcon Heavy’s first payload, Musk picked one of his used Tesla Roadsters to shoot into space, not the more typical dummy satellite often carried on test flights.